Dr. Giordano received his B.A. from Johns Hopkins University, his M.D. and Ph.D. degrees through a combined program at Rutgers University and UMDNJ - Robert Wood Johnson Medical School. He completed his residency training in Anatomic Pathology at the National Cancer Institute and fellowship training in Oncologic Pathology at Memorial Sloan-Kettering Cancer Center. He is is board-certified in Anatomic Pathology. Dr. Giordano is a Professor in the Departments of Pathology and Internal Medicine at the University of Michigan Medical School, the Director of the Tissue Core of the Michigan Comprehensive Cancer Center, Director of the Molecular Pathology Research Laboratory, a member of Anatomic Pathology Test Committee for the American Board of Pathology, and Co-Chair of the Thyroid Disease Working Group for The Cancer Genome Atlas project of the National Institute for Cancer. 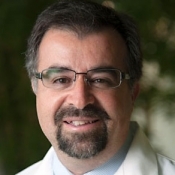 His clinical interests are in Surgical Pathology, Endocrine Pathology, and Molecular Pathology. His research interests are in endocrine neoplasia using contemporary molecular and genomic profiling techniques to address problems in oncologic pathology.